The California State Parks Off-Highway Motor Vehicle Recreation Division has received approval from the Office of Administrative Law for revisions to the safety regulations for Oceano Dunes SVRA. The new regulations took effect on January 1, 2010. 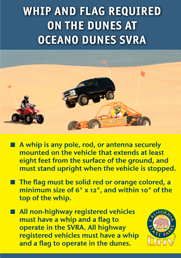 The regulation now requires a whip and flag for all vehicles in the dunes. This requirement is consistent with the regulations for Dumont Dunes and Imperial Sand Dunes Recreation Areas, which are popular areas managed by the Bureau of Land Management. 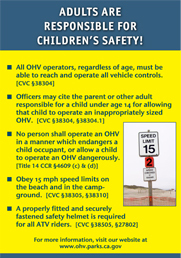 The regulation also prohibits specified vehicle operations that are unsafe but do not rise to the level of reckless operation or child endangerment. Except for two-, three-, and four-wheeled cycles, all vehicles shall be equipped with adequate roll bars or roof structures of sufficient strength to support the weight of the vehicle and shall have a secure seat and seat belt for the vehicle operator and each passenger. Seat belts shall be as specified in the California Vehicle Code.